(2012). Preconcentration of Zn(II) in Water Sample Using Modified NanoFiber. International Journal of Bio-Inorganic Hybrid Nanomaterials, 1(1), 47-58.
. "Preconcentration of Zn(II) in Water Sample Using Modified NanoFiber". 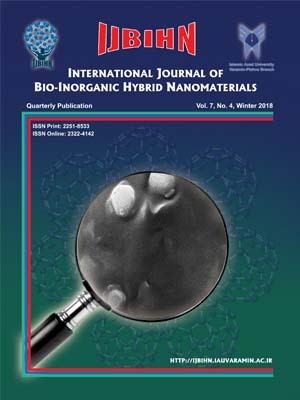 International Journal of Bio-Inorganic Hybrid Nanomaterials, 1, 1, 2012, 47-58. (2012). 'Preconcentration of Zn(II) in Water Sample Using Modified NanoFiber', International Journal of Bio-Inorganic Hybrid Nanomaterials, 1(1), pp. 47-58. Preconcentration of Zn(II) in Water Sample Using Modified NanoFiber. International Journal of Bio-Inorganic Hybrid Nanomaterials, 2012; 1(1): 47-58. A new simple and reliable method for rapid and selective extraction and determination of trace levels of Zn(II) ion is developed. Zn(II) ions are adsorbed quantitatively during passage of aqueous samples through PET-AA/AAm nano fiber modified. Almost all matrix elements were found to pass through the nano fiber to drain. Modified Poly (ethylene terephthalate)-grafted-Acrylic acid/Acryl amide Nano fiber was prepared by adding of acrylic nano fibers to methanolamine (PET-AA/AAm) with different concentration solutions. The stability of a chemically modified PETAA/ AAm nano fiber especially in concentrated hydrochloric acid which was then used as a recycling and pre-concentration reagent for further uses of Modified PET-AA/AAm nano fiber. The application of this modified PET-AA/AAm nano fiber for sorption of a series of metal ions was performed by using different controlling factors such as the pH of metal ion solution and the equilibration shaking time by the static technique. Zn(II) was found to exhibit the highest affinity towards extraction by these modified PET-AA/AAm nano fiber phases. The pronounced selectivity was also confirmed from the determined distribution coefficient (Kd) of all the metal ions, showing the highest value reported for Zn(II) to occur by modified PET-AA/AAm nano fiber. The potential applications of modified PET-AA/AAm nano fiber for selective extraction of Zn(II) to occur from aqueous solution were successfully accomplished as well as pre-concentration of low concentration of Zn(II) (60 pg ml-1) from natural tap water with a pre-concentration factor of 100 for Zn(II) off-line analysis by flame atomic absorption analysis.